The Light Commercial Division at Monthie Mechanical Inc is here to serve your needs, from light commercial to industrial HVAC applications and commercial refrigeration. We are a company that is committed to excellence in every aspect, from installation to service to customer care. 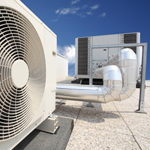 Commercial Planned Maintenance Agreements can save you time, money, energy and inconvenience. Call today for a free equipment survey.